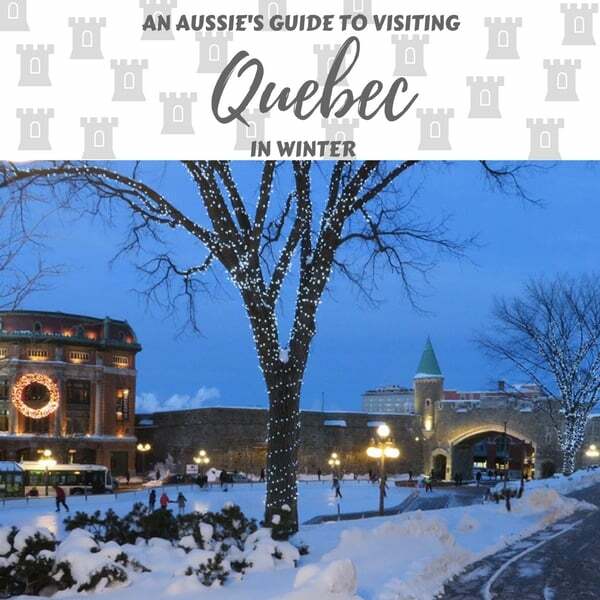 Planning on visiting Quebec in Winter? We did just that and today we are sharing what we did, what we ate and where we stayed! We recently travelled through Canada during Winter and had an absolute blast despite visiting during their brutally cold winter! Like any enthusiastic world travellers, we spent a great deal of time researching the cities we were visiting before we left home. One common theme we found was that that a lot of the resources and guides didn’t exactly specialise in Winter travel. So, here’s our answer to that! An Aussie’s guide to surviving & enjoying Canada in Winter. Quebec was the third Canadian city we visited, after Vancouver and Whistler. 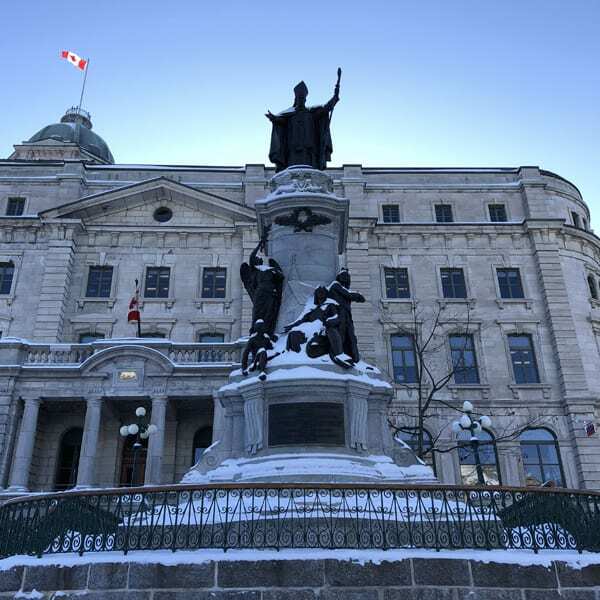 Most of you probably know that Quebec’s main language is French. I was a little worried at first that this might make things difficult for us, but these worries dissipated quickly. We found that majority of those who worked in customer service spoke English fluently as well as French, and we were able to get around with relative ease. We were in Quebec for 2 full days and found this to be plenty of time to visit the sights we wanted had planned, and some other’s we weren’t expecting! 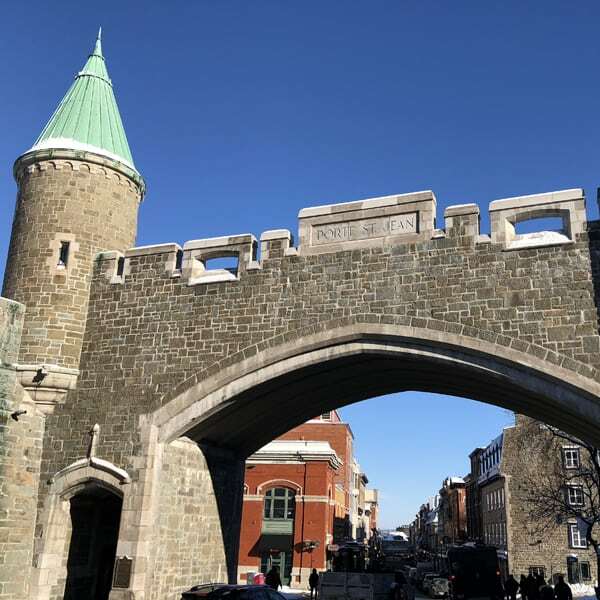 We stayed in the Marriot Downtown, which was about 100 metres away from Old Quebec, which is the only North American city to have preserved its defensive wall or “rampart”. Old Quebec is filled with quaint buildings and cobble stone streets. 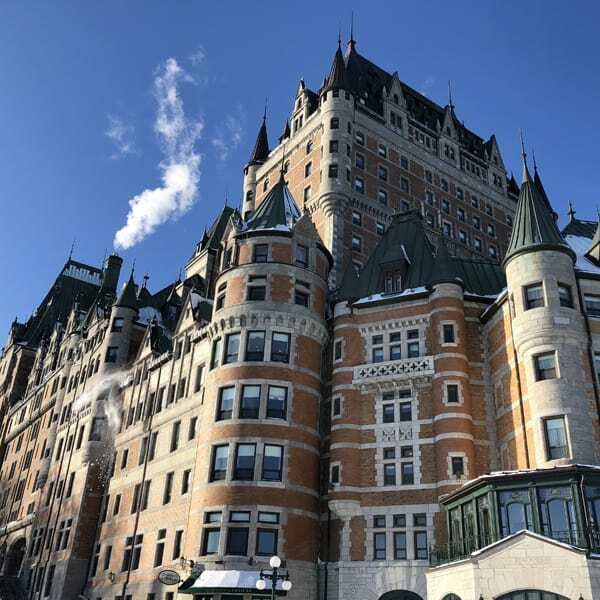 There’s a castle (Chateau Frontenac) that’s been turned into a Fairmont hotel, a beautiful basilica (Cathedral-Basilica of Notre Dame) and plenty of shops, cafes and pubs to keep you entertained for hours. The average temperature during our visit to Quebec was about -16C / 3F, so needless to say we tried to limit our time outside as much as possible without missing out on anything. 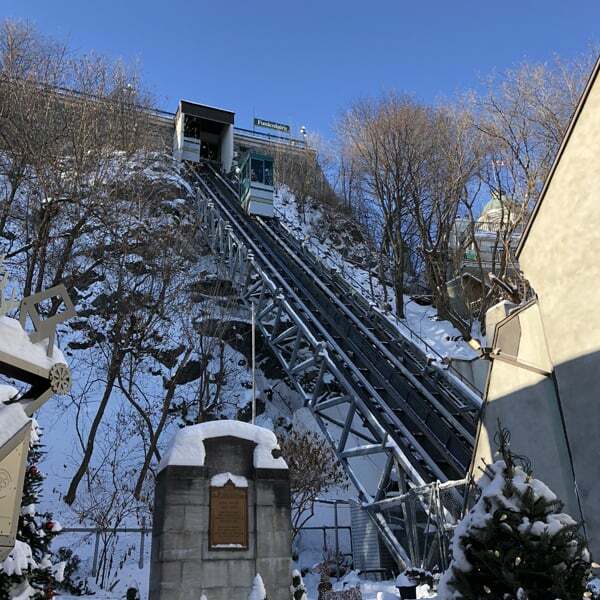 Since we were exploring via foot, we made an effort to go into shops regularly for some relief and we even had a go on the Funicular Railway to avoid walking too much in the cold. 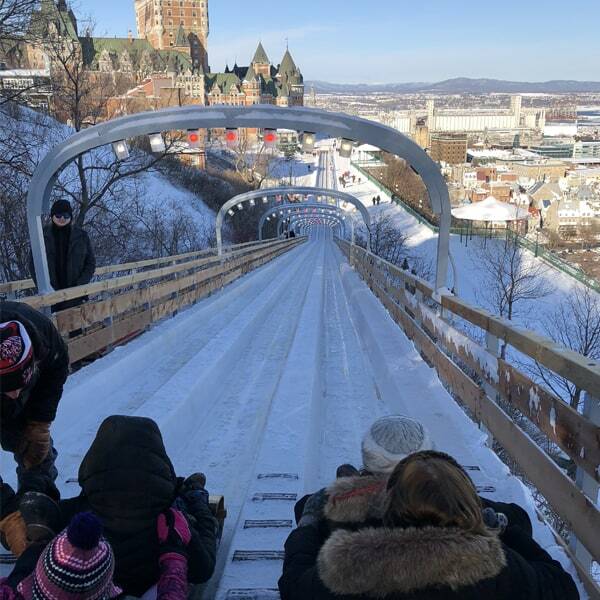 We found a toboggan slide in front of Chateau Frontenac by chance and if you find yourself here in winter you have to give it a go! It cost us only a few dollars each and was one of the highlights of our visit to Quebec. Not only do you get an amazing view of the river and the surrounding Old Quebec, but you pick up some great speed coming down! Another thing we accidentally stumbled upon whilst strolling around Old Quebec were these intricately detailed murals painted onto the side of buildings. One we saw was like peering inside the building in olden times. 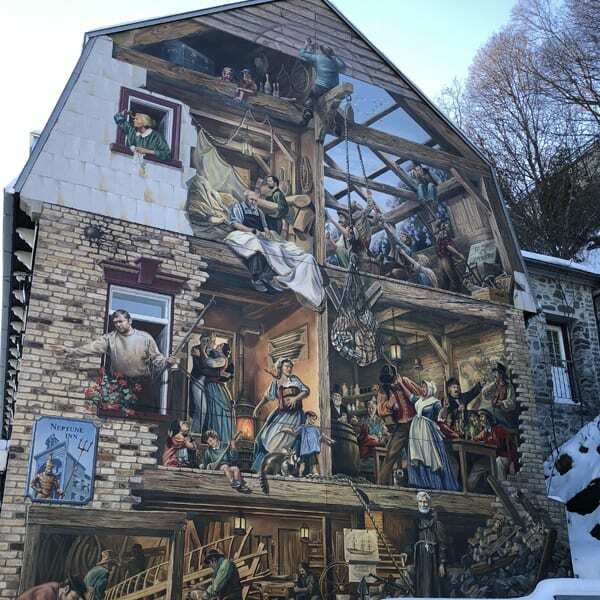 Another told the history of Quebec City through the mural. We stood in front of them for ages just taking every detail in. 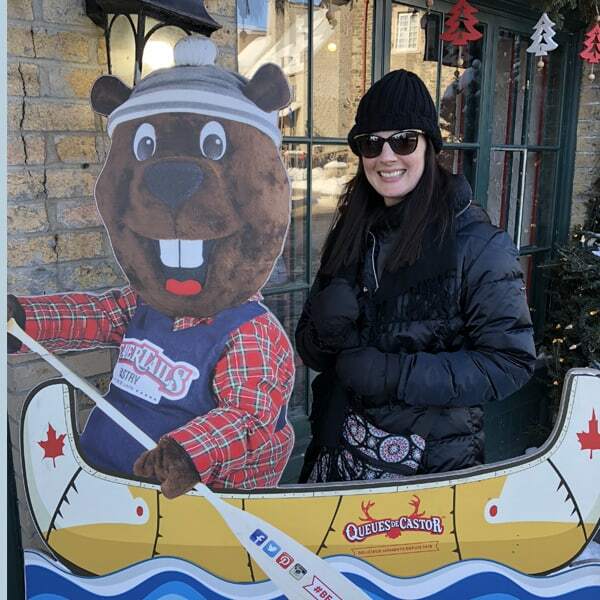 We also had make a stop at the Queues de Castor store to try our very first Beavertail – fried dough pastries that are hand stretched to resemble a beaver’s tail. We shared one that was smothered in Nutella and I only wish we bought two. It was just that good! 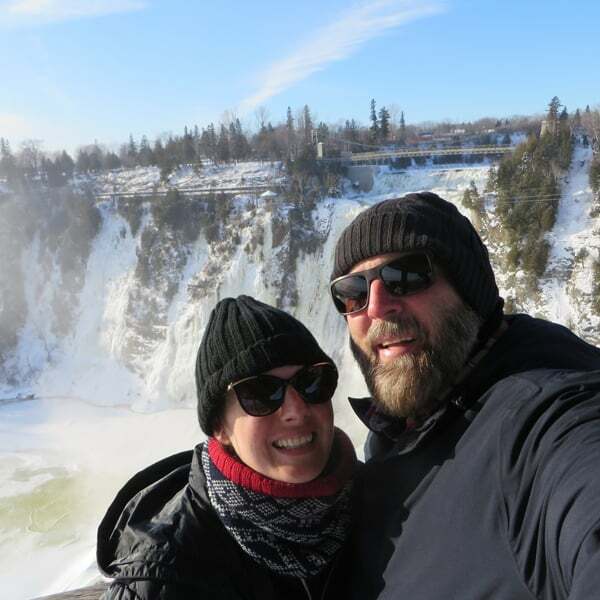 Having spent one day exploring Old Quebec we decided to spend the next day visiting Montmorency Falls. We had absolutely no idea what they’d be like in Winter or even if they’d be accessible given everywhere was blanketed in snow, but we gave it a go regardless. We caught a bus from downtown which took about 30 minutes and was fairly easy to navigate considering all the stops and announcements were in French. And once we got there we were so glad we made the trip! The falls were absolutely beautiful. Whilst they weren’t completely frozen over, most of the falls and the river that surrounded it were covered in ice. It truly was a magnificent sight to see. We were in Quebec just before Christmas, so we were also able to explore the German Christmas Markets. We aren’t exactly market people and weren’t wanting to buy any souvenirs or gifts just yet given we still had 3 more weeks of travelling to do, so the markets were a bust for us. But if you find yourself in Quebec in December they are still worth a walk through. 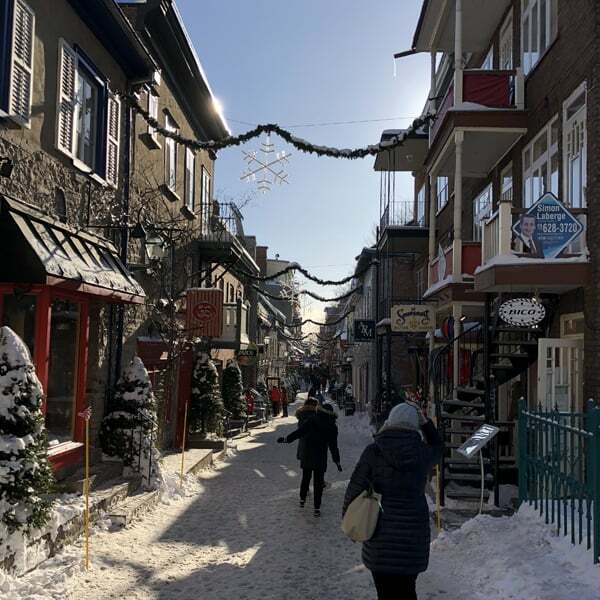 Quebec is a city that is amazing to explore in Winter. The snow gives the old city even more of a romantic feel, and there is still so much to see and do despite the chill. This is one city I’d highly recommend checking out in the Winter months! D’Orsay Restaurant – Delicious European pub fare. I had a salad and French onion soup and Adam had some mustard crusted pork chops. Everything was delicious. Queues De Castor A.K.A Beavertails – As I mentioned earlier, you just have to try a Beavertail! I would describe it as a flattened doughnut that is covered in whatever you want! Que Sera Sera – This was the restaurant in our hotel and we hit up breakfast here every day. We made a decision to never have a buffet breakfast for our entire trip (rarely good & always eat too much crap) and we really happy with the menu options here. I even tried Budwig Cream for the first time ever and really want to try and recreate it at home. 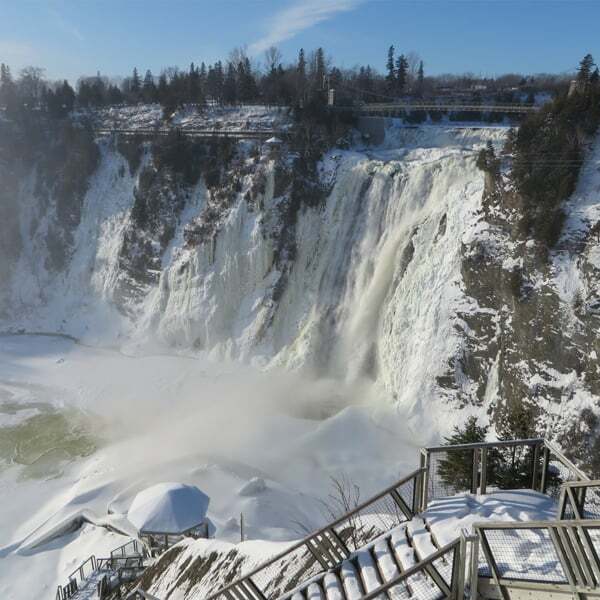 This is the third part of our Canada Winter Travel series. Be sure to check out the Vancouver and Whistler posts! Go on… Pin it for later. You know you want too! So nice and your pictures are so attractive. Thanks – Adam is our chief travel photographer!